Add your own captions in the text box below. George Bush: He converted to Mormonism right before he died. Dallin Oaks: Dammit Boyd, my arm's fallen asleep. I don't know why I ever agreed to this crazy PR stunt! 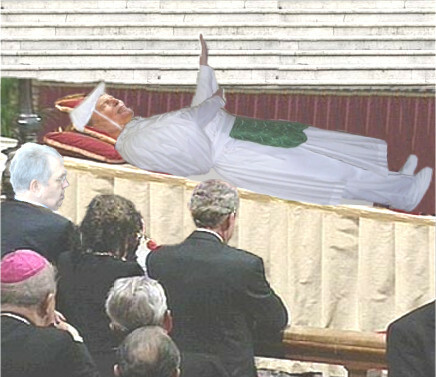 Boyd K Packer: We secretly replaced the Pope's body with Dallin's. In a moment I will command him to arise and walk. The Catholics will see this as a miracle which will cause even more Catholics to join the Mormon Church, which means more money for the Mormon Church, which means more money for the Republican Party! Pope John II: Those Mormons are going to burn in hell for this! Boyd K Packer: That's quite a prank your Bonesmen pulled off Mr. President!